I have good intentions, but I am only human do make mistakes and forget things I should be remembering. For example, I own many reusable bags, but its happened to me a few times where I have went to the grocery store and had forgotten my bags at home! I always feel so guilty and sometimes the cashier gives me a weird look when I tell her I need plastic bags. To top it off, most grocery stores actually charge you $ if you use plastic bags. The grocery store in my town actually gives you a penny back on your purchase for every reusable bag used to bag your groceries. I am to happy to say that there is a company out there whose mission is to ensure we all remember to bring our own bags shopping. That company is Bagnesia (don’t you love the play on words!). Bagnesia understands just how harmful plastic bags are to our environment. They have some staggering envirofacts on their site that is worth checking out. For instance, did you know that there are 100 billion plastic bags used per year (according to the Wall Street Journal)? That’s a lot of shopping and a huge amount of space in our landfills. 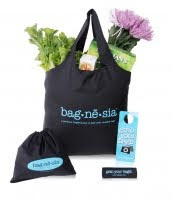 Bagnesia has products that will help you to remember to bring your bags including Reusable Bag Shopping Kits and accessories. I received the Reusable Bag Reminder Kit for my review which includes a reusable bag, door hanger, steering wheel wrap, clip and a reusable pouch. With this kit, there’s no way you are forgetting your bags! The bag is made from waterproof, lightweight washable nylon and is a good size and will hold up to 40 lbs. It can be compared to using 2 to 3 plastic bags. It is easily rolled up to fit into a small place in your purse or glove box. I like that it is super strong and I can usually fit most of purchases just in this one bag. It is a simple black colour with the blue Bagnesia on its front. I keep mine in a pocket in the front of my purse so I always have it on me and its been working great for me so far. The laminated door hanger is something you put around the door knob to remind you to grab your bags as you leave the house. We have put ours on the inside of our front door and it has served as an excellent reminder. We have remembered to always have a reusable bag on hand for those impulsive shopping trips. It doesn’t really match my decor since it is turquoise, but that’s ok for now. Once its message has become ingrained in our consciousness to not forget our bags, we can always take it down. The steering wheel wrap is made from flexible black neoprene that reads “grab your bags”. You can also use it on your parking brake or a car seat. I have ours around my car’s steering wheel and it does do a good job as a reminder. This one matches my car better since it is black with blue printing. For $14.99, you can purchase this kit from Bagnesia. I think it is a great buy for anyone who does need reminders to bring their bags. We all need to do our part to help the environment and every little bit counts! I follow this blog with Google Connect and subscribe via email. I like bags that fold up easily like these and keep canvas ones in my car for planned and unexpected trips to stores.